Established in Britain by Tom Joule nearly three decades ago, Joules is a premium lifestyle brand with an authentic heritage. 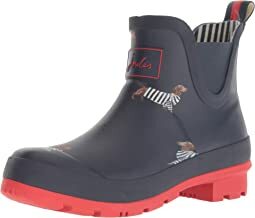 A true multi-channel brand, Joules carefully designs clothing, handcrafted rain boots, sandals and accessories for women, children, baby and men, as well as an expanding range of homewares and eyewear collections, with personality to match those of its customers’ colorful and uplifting outlooks. Quality, Britishness, family values, color and humor make Joules stand out from the crowd. This approach, along with an unwavering attention to detail, and drive to surprise and delight its customers with unexpected product details, has been central to the brand’s success and expansion and remains at the heart of everything Joules creates. I was very disappointed by my order from Zappos. Normally I can always count on Zappos for a dress for holidays. This dress arrived and I was bummed that I couldn’t wear it for Easter. The dress had clearly been used. It was faded, nubby and it reeked of body order. No tags on the dress. The condition in which is arrived is unacceptable. This dress is going back today. Hopefully they discard this dress instead of sending it out again. I was excited to see a foot bed liner in this that was soft, however now it is the thing that annoys me the most. The liner never stays in place and is very uncomfortable when it slides up your leg or to the entire side. The boot fit my foot perfectly. The issue is the calf opening is way too big for me (though I don’t normally have issues one way or the other with boots). In the rain, the opening is so big it would allow water to just gush in from the top. It also makes noise while walking as the boot slams from the front of my leg to the back. Opening needs to be at least 2” smaller or actually adjustable (buckle is cosmetic only) for these to work. Too bad because they are super cute. Fit and sizing is spot on! 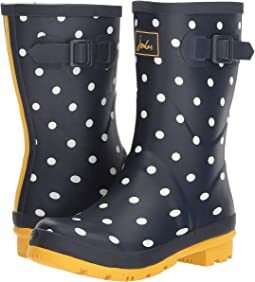 I am in love with these new rain boots! Got the bee pattern and they are just so darn cute! Feels awesome on, like I could wear them all day. Tried the Ugg Siena and they kept coming back with one boot crimped, so a nice surprise to find the Joule's and love them! Highly recommend in whatever pattern speaks to you, they are so much fun. Returning as they are too heavy! I usually wear a 9.5, sometimes a size 10. 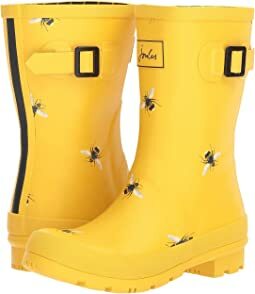 I ordered a 9 because the reviews say these boots run large and ordering an entire size down may work. Long story short - the 9 is too small, the 10 is too large. I wish they had my normal size of 9.5. 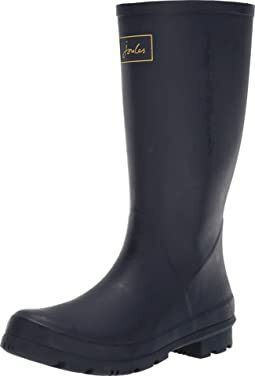 Also, the ankle on these boots is more fitted than most galoshes. It's difficult to remove the boots when I have socks on. 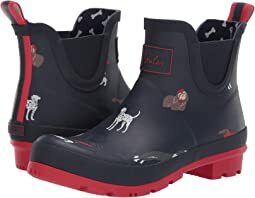 These boots are adorable. The polka dots and fuschia soles are super cute, but I think the fuchsia stripes up the back make them. The soles are good and sturdy, but they are lighter weight overall than similar styles, which I like. They come with a storage tote and they roll up easily. Love them. 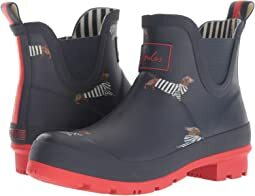 These are adorable in person and are great for outside work in a wet environment. I wear size 8.5 and 9 in most shoes. I ordered these in 9 and they are just a smidgen too large, but with warm socks will be perfect. If reordering again, I would go with the 9 as the 8.5 might be a smidgen too small. Love the style! Seems a bit larger than a normal 10, though, so I am returning it. 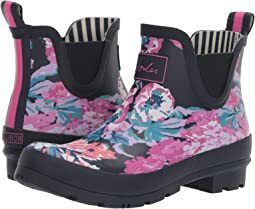 Love the style of these, but they were a bit large (I wear a size 10, and am going to try the smaller size and the smaller width). The colors are great and the quality is clearly very good. I wear an 8 wide and they fit with orthopedic inserts. And they're just so cute!! I normally wear an 8 1/2 and sometimes a 9, but sized down after reading other reviews. These fit perfectly and comfortably with medium-weight socks. I'm looking forward to the next rainy day! 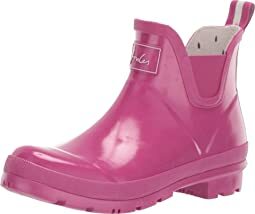 Cute rainy day boot + Exceptional Zappos service = Happy as a clam. In the rain. ? 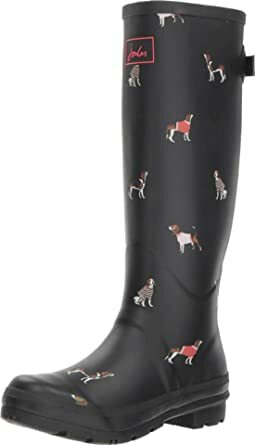 I love the rain boots. They are stylish yet very comfortable. Super cute. Appear to be well made and hope they last for years to come. Honeycomb pattern on inside is a cute detail. The tall version of these were too tall. The mid is perfect! 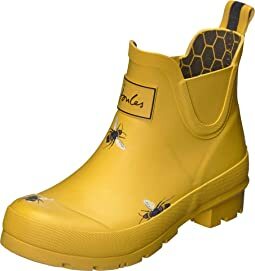 I ordered this boots in a 5 and they came as a UK 6 and US 8. Wondering if it was just a warehouse mistake ? 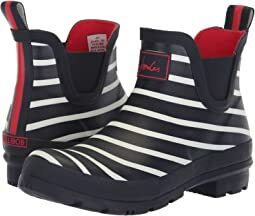 Great boots with a lot of comfort. Order a full size down. 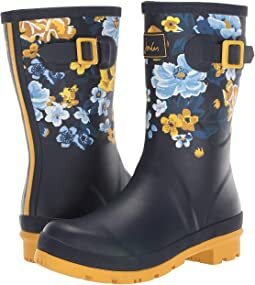 I needed rain boots and hesitated for a long time before buying these. 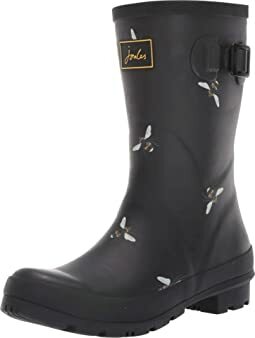 I didn't want green Wellies, and I wanted boots that looked good with my black rain coats. 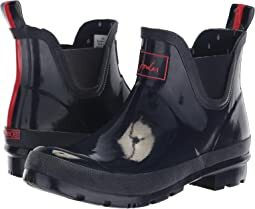 I wouldn't count on these for lots of arch support but I didn't buy them for support; I bought them so I could walk a few blocks in the rain while keeping my feet dry. I normally takes a 6 1/2, and Joules recommends going down the half-size. I bought the 6 and I'm glad I did. Runs big. Cute and comfy, but had to return. 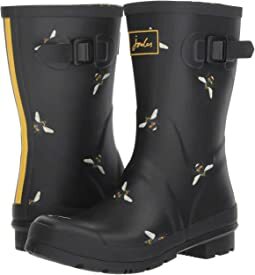 My daughter loves her black mid Wellies with bees. Thank you for the easy exchange, Zappos. Cut very large (voluminous, even). Size down. I just love these boots. They slip on and off easily and are not too tight around my chubby legs. They are much more comfortable than I anticipated. 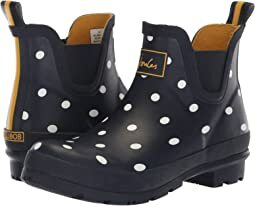 I got the navy with white polka dots and get tons of compliments. 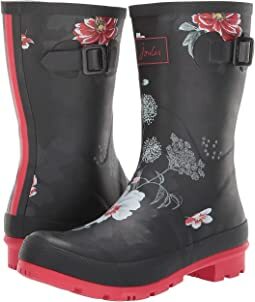 They are perfect for the muddy spring.